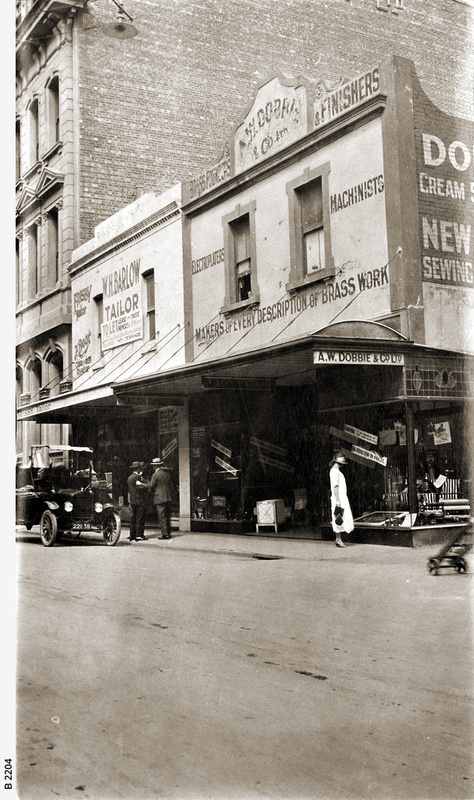 Gawler Place, Adelaide, west side, south corner of Featherstone Place, taken on 26th February, 1924. A lady in Twenties fashions is looking in the shop window of A.W. Dobbie & Co., Brass Workers and Electroplaters. On the left is a Tailor's premises. Near side of tall building on extreme left is 18 yards south of Featherstone Place. For a view of Dobbie's building after remodelling in 1949, see B12356.